This song is based on Matthew 6:25-34. It was written by Sebastian Temple, and included in the 1967 recording, Happy the Man, which is described here. It was also published in the UK in 1974 in the 20th Century Folk Hymnal, Volume 1. The original title was "Leave it in the Hands of the Lord" but later use generally refers to is as "Do not Worry". The un-named tune was also written by Temple. It has a 4/4 time signature, and was originally published in the key of E. The first few notes in this key are c B AE Ac B A G.
The song isn't covered by CCLI licenses. Some books say that copyright is now managed by OCP Publications - but they don't currently have it in print. It is in the currently in-print Celebration Hymnal for Everyone from McCrimmon Publications. Lead sheet style music is currently available here. Like many of Temple's works, it has crossed denominational and cultural boundaries: although it isn't widely used, there are references to it being sung in a Baptist church in 2003, and being used at (presumably Roman Catholic) Mass, and requests received by this website show that it is known in Africa, too. Sheet music is available in the Happy the Man songbook. what to wear or put on your feet. 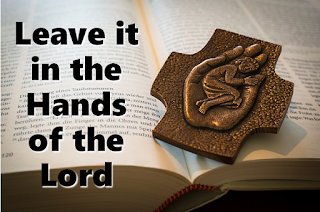 then leave it in the hands of the Lord. 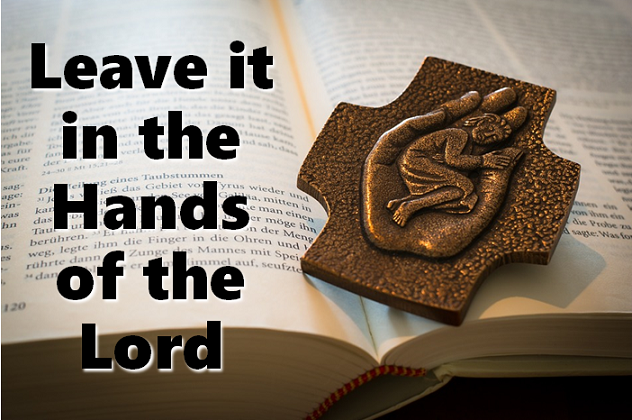 Leave it in the hands of the Lord.